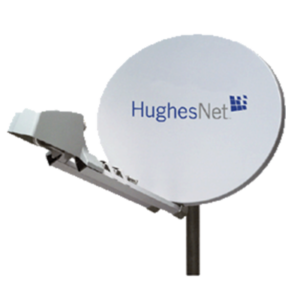 HughesNet launched its final 5th generation satellite in December 2016 and rolled out Gen5 service to customers in April 2017. 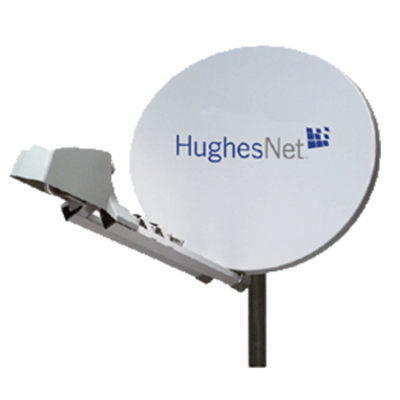 Unlike the limited coverage of HughesNet Gen4, Gen5 covers the entire continental United States, parts of Alaska and Canada, and even into Mexico with faster service than HughesNet has ever been able to offer before. This is a huge improvement over older generations - and makes HughesNet a very interesting option for RVers who travel frequently out of range of cellular towers. Gen5 standardizes the speeds to offer a promised peak of 25Mbps down and 3Mbps up, a substantial improvement that makes HughesNet a lot more competitive with LTE cellular technology. 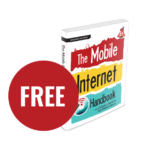 MobileInternetSatellite.com sells everything you need to get started. Service will require a HT2000W satellite modem, radio and satellite dish. Plus a tripod and cabling. If you're purchasing equipment new, anticipate that the start-up costs are around $1200-1500 depending on what you select. There are auto aiming roof mounted options too, which brings the price into the $15-20k range. On top of that, you'll need a compatible satellite service plan which start at $49.99/month for 10GB of anytime residential data (plus 50GB overnight) all the way up to $389.99/month for 200GB of business data. Do keep in mind - traditionally all HughesNet plans require agreeing to a multi-year contract to sign up for a new tier of service. 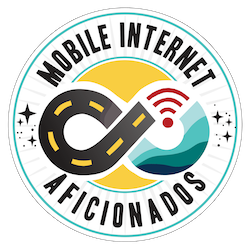 What About Mobile Satellite Internet ? Spot beam services in the past have typically never officially supported mobile users. If you try to connect outside your home "spot" the system will ignore you unless your account has been specially provisioned. 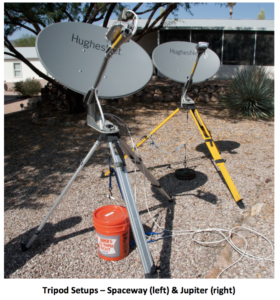 HughesNet has NEVER directly supported mobile satellite internet installations - they will only directly setup fixed location stationary installations. 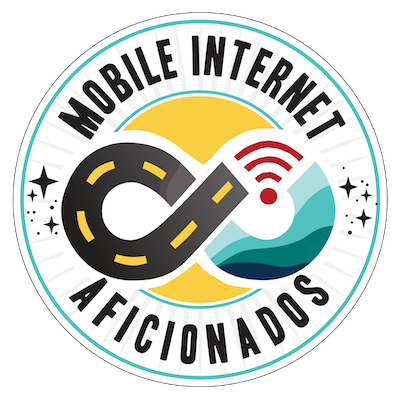 This makes satellite internet service particularly tricky for mobile users to take advantage of. There are two ways around this spot beam limitation, offered only by select vendors able to setup customers for mobility. We do not intend to obtain a HughesNet tripod system to test first hand, due to our own lack of storage space for the bulky dish required. But we have owned and used a previous generation (Gen2) HughesNet tripod system, and we are tracking several people who have purchased Gen3, Gen4, and now Gen5 setups and who have shared with us their first hand experiences. Our member section below goes over these options & plan costs in greater detail. Some insider information and tips are shared with our members below. 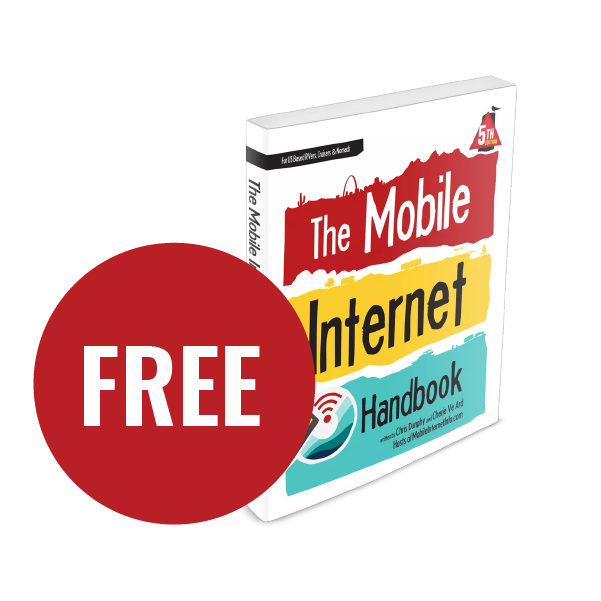 You can NOT sign up for "mobilized" HughesNet service directly with HughesNet, and you can not easily take an existing residential HughesNet system on the road. (Members check our Discounts Page for special savings). Real Time Communications (RTC) can also provision RVers with mobile satellite service.